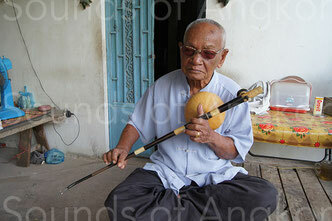 Monochord stick zither - ksae diev - Site de soundsofangkor ! The monochord stick zither with a gourd resonator is called: ksae diev (pronounced sigh dyoo) or khsae muoy, that's to say 'one string'. The first iconography in Cambodia dates back from 7th c. in Sambor Prei Kuk. 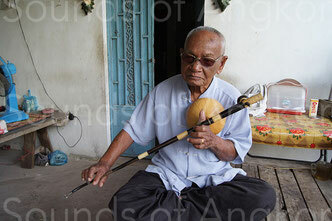 Its practice has almost disappeared after the Khmers rouges genocide in the 1970s. 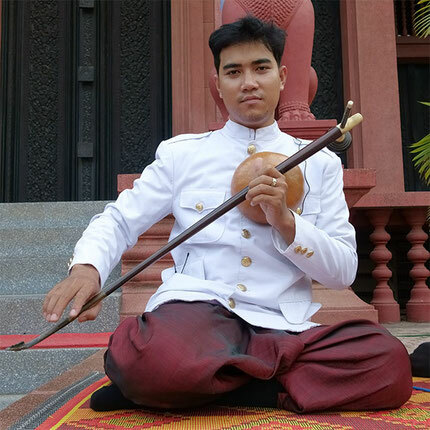 Thanks to the tenacity of Master Sok Duch, several musicians of the younger generation can now ensure its sustainability. Before the revolution, the ksae diev was played in the wedding orchestra (plenh kar boran), the magic healing orchestra (plenh areak) and sometimes also by the blind singers as a song accompanying. This use is perhaps the secret of its longevity. 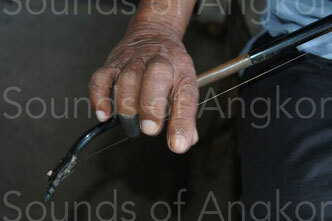 The ksae diev is composed of a handle turned in wood of neang nuon or kranhung. The end of the instrument is made of a piece of buffalo horn or of fire-bent wood; it's carved in the shape of a naga head and fixed to the handle by means of a metal ring. 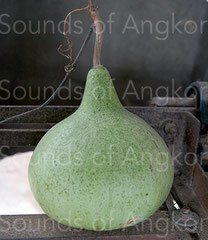 This naga head (bangkien) is used to tie the brass string. The other end of the handle is pierced with a hole in which a peg (pranuot) engages; its palm is sometimes be nicely decorated. This peg controls the tension of the string. The instrument measures between 80 and 88 cm depending on the manufacturer. The whole is calculated from the total length of the musician's arm if he makes it for himself (from shoulder to fingertip), plus the length of a hand, from wrist to the end of the raised thumb, so that the curvature of the bangkien follows that of the thumb. The length is adapted to the size of the musician in the case of an external order. The handle is in three parts: a 65 cm body made of kranhung wood, a copper or brass tube of 9.5 cm which fits on the handle to a depth of 4 cm, finally the bangkien of 18 cm added of 4 cm that sinks into the metal ring. The peg, in one piece, is shaped by lathe. A half-calabash (khlok) is attached to the handle by a Nylon string (formerly by rattan) passing through the neck of the calabash and attached to a washer in shell of coconut. This large washer keeps the Nylon inside the calabash. Once "screwed", she tightens the handle on the calabash causing a tension on the Nylon. The calabash is fixed on the handle of the instrument to a span of the peg. 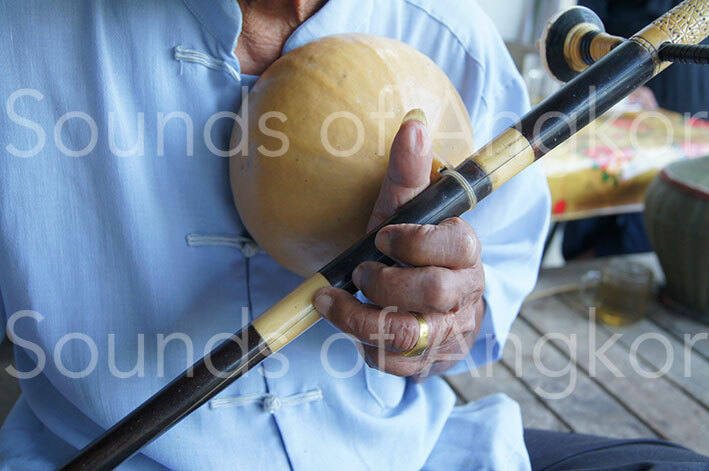 Other musicians measure the location of the calabash by counting one cubit plus one hand, plus an inch from the bangkien. The rope is a brass wire purchased from merchants that the musicians then thin by successive stretching. It is attached to the bangkien on the one hand and to the peg on the other hand and passes under the Nylon of the calabash. The vibrating part of the string is that which goes from the bangkien to the Nylon of attachment. The instrument is held in hand, calabash in the center of the chest. The handle is in an oblique position with respect to the body, the peg being, for right-hand musicians at the height of the left shoulder. The technique of the ksae diev is very difficult. The fingers of the left hand (index, middle and ring fingers) press four points of the string near the fastening Nylon to vary the tension of the string. The sound is produced by plucking with a metal tab attached to the right ring finger at several precise points of the string. The height of the degrees is given by slight touching of the right index finger which hardly touches the string at the same time as the tab. The artist can play an octave and a half, sometimes two octaves if he is really a virtuoso. In the orchestra, the vacuum string is usually tuned according on the samleng ko note of the oboe. 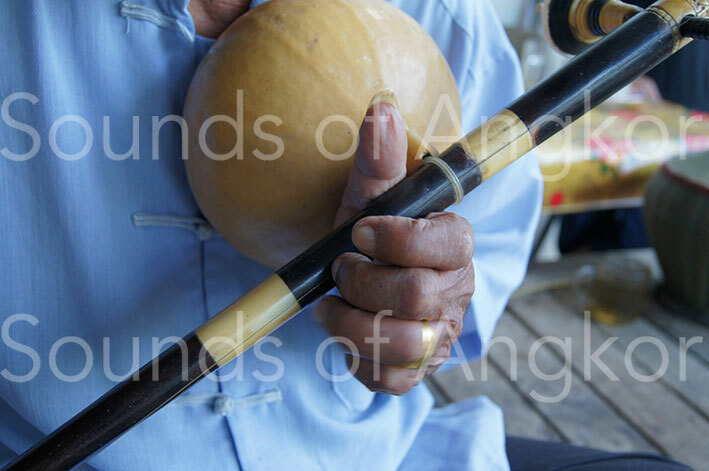 By placing the calabash more or less on his chest, the musician can hear with more or less power the harmonics on which he plays. 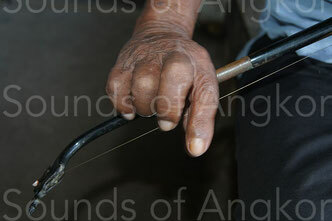 'Play ksae diev' is said 'dench ksae diev' in Khmer = pluck the monochord. This article is both a translation and an updated revision by Patrick Kersalé of "L'orchestre de mariage cambodgien et ses instruments" written in 1968 by Jacques Brunet. In: Bulletin de l'Ecole française d'Extrême- Orient. Tome 66, 1979. pp. 203-254. Master Sok Dutch playing the first position with the right hand to get the first partial. The tab plucking the string. Second playing position of the left hand. The first one is played by the forefinger. Calabashes under an arbor. To obtain beautiful specimens, they must not touch the ground during their growth. Master Sok Dutch playing the second position with the right hand to get the second partial. Position of the ring finger after plucking the string. Third position of the left hand. Sinat Nhok is was a student of Master Sok Dutch and one of the best kse diev player of the young generation. Here, he plays Sompong. Lun Sophanet plays Khmao Bong "My darling".